Q: I read about using paper, water, and cement as a plaster. I don't know how it will withstand our termites so I will have to give it a try. A: As you may know, we used "papercrete" to plaster both sides of our domes, and it has worked out very well. Papercrete is basically made with water, paper and Portland cement, but the paper is turned back into a pulp in the process of mixing so that nothing is readable any more. A more durable final coat can be made by adding quite a bit of sand to the mix. This material does seem to resist termites and other insects. Q: I plastered my earthbag building with papercrete. Then I left it for one year without roofing it. I am from Dar-es-Salaam in East Africa. My building is under the shade of big trees. After an annual rainfall period, I found out that the papercrete turned black in color. I have some knowledge in mushroom substrate science. When the paper in in the composition stays wet for long time it becomes a good medium for fungus to grow, which decomposes the paper. As a result, the papercrete deteriorates and becomes unsuitable. Please advice me on this problem. A: I am very sorry to hear about your problems with the papercrete. I do not advise people to use papercrete in damp or humid conditions, because of this very problem. I had a little mold form inside my earthbag/papercrete dome, which I then plastered with a thick layer of lime plaster, which took care of the problem. Another possibility would be to kill the mold with bleach or something, and then replaster your walls with a cement stucco. Q: Will papercrete work on a 45 degree slope? My current design is a scoria-filled earthbag pithouse with a 45 degree roof. It's not a matter of getting it to bond like on a ceiling, but rather if it will hold up to the weather and keep water out. This design is only for dry climates. A: I would have to say after my experience with the domes in Crestone, that I would not expect PC to hold up for a very long time. By the time we sold it (after 7 years) the PC was eroding in places where there was more severe elemental abrasion, such as at the bottom of the windows or on the top of the entry vault. The folks who bought it have noticed this and asked my opinion about what to do to protect it, and I have suggested that they actually do a final stucco coating to make it all much more permanent. Q: In the mix of paper with cement what was is the rough percentage of cement for papercrete? A: Basically the mix that I use mostly is: 50/50 paper and cement by dry weight, and the amount of water doesn't really matter...just enough to make the slurry. This is for "pure" papercrete, without sand. For a more durable product that doesn't shrink as much and is less likely to burn, add some sand to the mix, and reduce the amount of paper proportionally by wet volume. It is best to experiment and come up with a mix that works for what you are doing. Q: For stuccoing walls, it seems to me that paper and cement mix does not get wasted as much as a mix of fine earth and cement. Although not a major cost, we have to throw a couple of layers of mix in our Hawaiian dome after some of the mix just does not hold on the wall. Seems like a crafts and artist job, the better with your hands the less waste you get. A: Yes, it is a tricky business getting plaster to stick, especially to the inside of domes. I finally came up with a technique of throwing just a thin layer of papercrete on the bags at first, and then adding more after it set up. Pure stucco is much heavier, and so even more difficult to make stick. Q: Can you tell me how thick the layer of papercrete is over your house? Is it easy to keep warm? A: Both the dome and the vaulted earthbag structures that I built have an average of about two inches of papercrete covering them. They have since been stuccoed because the papercrete was eroding in the weather after about a decade. The earthbags themselves were filled with insulating volcanic stone, so the entire envelope was very insulating and easy to keep warm. 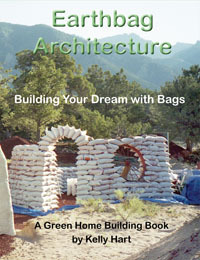 Q: How has the papercrete plaster on your earthbag house stood the test of time? A: Overall, the structure is as sound as the day I finished it. I'm sure there were also a few cracks in the PC plaster that developed over time, but I never worried much about them because of the nature of the wall system employed. As you know, the papercrete was used a plaster over the earthbags, both inside and out. After about a decade of exposure to the elements, the exterior PC plaster was showing signs of erosion in certain places, most notably at the base of the embedded glass where moisture would accumulate and on the more horizontal aspects, such as over the door eyebrows and the top of the vaulted entry way. The folks who bought the house were concerned about this, and so was I since I expect that house to last for centuries. We discussed how to protect the plaster generally, and at my suggestion they went to considerable expense to have a professional stucco crew do a stucco job over the entire house, complete with more wire mesh embedded in it. Papercrete makes an excellent substrate for almost any further plaster work, since it is so amazingly dimensionally stable under most any condition. The lime plaster I troweled over the interior PC has held up very well, and I expect the exterior stucco to do the same. This does mean that the structure is not quite a breathable as it was with just the PC plaster, but I think it is sufficiently breathable, especially since it can still breath quite well inside. I was always amazed at how well the combination of earthbags filled with scoria and plastered with PC performed as a skin for the house. At least in this rather arid environment there was never a drop of moisture that came through that package. I think that the PC acted like a sponge and just held the moisture at that level, allowing it to soon evaporate rather quickly. It was never damp long enough to develop any tendency to support mold. I would never recommend that folks use PC as a solid material for a roof, either on a dome like mine, or on more conventional roofs. All of the major problems I know about (and there have been several of them in the Crestone area) where mold has taken hold, have been either in situations where the PC formed the roof or was in contact with the earth near the foundation. In several cases attempts were made to seal the roof with tar or Elastomeric paint or some such impermeable barrier, and these always failed eventually. Moisture would find a way to enter through small cracks and then get trapped into the absorbent PC. The moisture barrier would then effectively prevent the PC from drying out and in the warm interior environment mold is the natural result. One person saved his house by creating an elaborate tent-like structure over the entire house, with an air space between the two so the PC could dry. I do know of a few instances of the use of PC as a plaster over strawbales, and this has also worked pretty well. The PC is naturally more absorbent than the straw, so it tends to wick any moisture away from the straw and actually help with the molding potential...at least that is my take on it.